- The braided lines are stronger and good for big fish. Are you interested in an excellent 4.4” gear that can help you remain in charge as you battle it outwith fish in deep water? If yes, why don’t you try out the Fin-Nor Offshore Spin Fishing Reel? 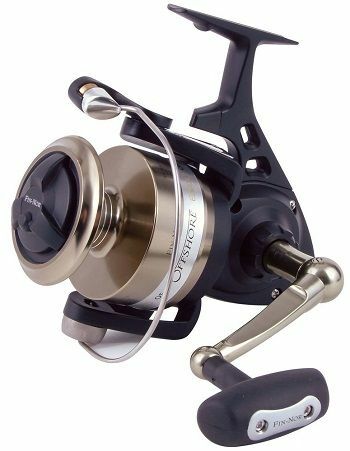 It is a great reel who’s’ body is made of aluminum and consists of 4 double shielded bearings with a stainless-steel center shield and driver gear. It is a reel that is very popular among anglers since it guarantees to beat the big fish. The new Fin-Nor Offshore spinning reel comes in six sizes and features a flex-free aluminum rotor and body, a mega Drag system, and an oversized knob. It comes with stainless steel washers and 10 carbon fiber. It is designed to handle a large offshore predator. The reels offer 4.7- 4.4- to -1 gear ratios. They range from the 9500 for 20-pound mono to 4500 for 17-pound mono. The OF95 is one of the six reels that is capable of 27.2 kg drag in a line capacity of 550m of 80 lb. braid. 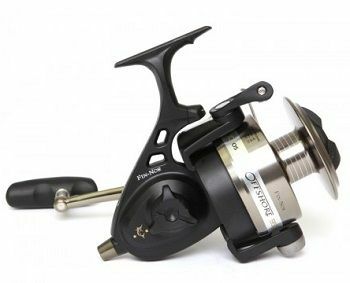 In a nutshell,the reel is designed with an aluminum body Stainless steel drive, rotor, and side plate. Even though the material used to make the frame may not matter much to some; those that have aluminum frames are more durable and will last longer. They are of high quality, and lighter than reels made of graphite. The Fin-Nor Offshore spin has a smoother free spool and uses less line because of the aluminum body, rotor, and side plate. The reel is easy to use, light and stronger.Also, the reel does a better job in fresh water but may not help you much if you’re playing field is salt water. Its body is solidly constructed, has no lose parts and the moving parts are all smooth. Obviously, the spool plays a critical role in holding the line and determining the smoothness and the distance that will be cast. Fin-Nor Offshore Spin reel comes with a forged aluminum spool which is rigid under pressure and offers greater strength. The spool allows for less line friction hence increases the distance cast by the angler. Also, it is efficient and allows for faster retrieves, increased in line pickup and reduced inline twist. It also helps to reduce the tangle, which is common in spinning reels. Spinning reels’ feature bearings to help them remain smooth. The bearings support stability as well.Thus, the more the bearings a reel has, the smoother it performs. Also, if the reels are sealed with stainless steel, it becomes more durable, and it can easily be controlled. In-Nor offshore spinning series has four double shielded bearings that guarantee a solid foundation for the steel pinion and stainless steel driver gear. No wonder that the reel is always smooth in performance. 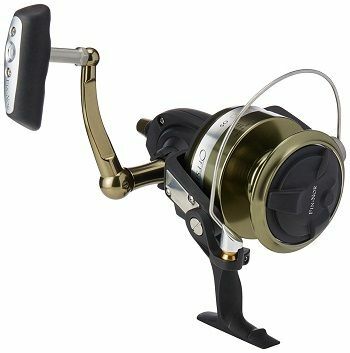 Also, the reel comes with powerful 4.4:1 gears that enable the angler to control it and remain in charge of the battle even when in deep water. Fin-nor offshore spinning reels are advertised to be the best when it comes to controlling them in deep water. They are made of an off show Mega Drag system consisting of stainless steel washers and carbon fibers, which make them ultra-smooth and durable. The fiber Mega Drag system allows the angler to choose to tie the braided line onto the spool and not worry about slippage. This drag model allows the angler to pull the line at any given setting without affecting the pressure, hence the system remains consistent throughout. The Fin-Nor Offshore Spin Fishing Reel is a spectacular workhorse that can continuously handle a substantial drag without breaking. Its line capacity, the price are all fantastic. The reel is robust and can stand up to any challenge. Also, if you are planning to fish in saline water, it is the best reel you can ever buy. However, it is important to note that the reel is not versatile and does not have many features. It is a little bit heavier than other reels and may not be efficient when put on a mono backing because such an act rots the spool. Thus, the reel may not be useful to advanced anglers.